The evolution of security camera systems is constant. Samsung is notorious for their latest technology and beating others in the field of security. 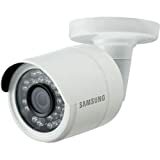 Samsung security camera systems are known to be top of the line and smarter with every generation. Samsung seems to understand that everyone has specific needs when it comes to security. Not everyone has space, for instance. One person could only need one camera, while another customer requires an entire indoor and outdoor system. For instance, the Samsung Wisenet Super HD DVR Video Security System includes everything but the kitchen sink. A system that large is usually for commercial use, or if someone owns a large house with large grounds. Others feel safer with every nook and cranny under surveillance while away. However, it is not wireless. If cords and cables do not disrupt the flow of a room, a corded security system allows for a DVR to be attached. Samsung’s wireless cameras are as top-tend as their corded system. The Samsung Smartcam is customizable to a user’s needs. No cables or cords are required to utilize the Samsung Wisenet SmartCam. The homeowner receives alerts through smart devices and WiFi connections. While cheaper and smaller, cordless has less storage and lacks some of the benefits that corded systems employ. 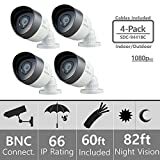 Applying the pros and cons to the same Samsung security camera systems forms a complete picture of what they have to offer without muddying the waters with every generation of Samsung technology. The Samsung Wisenet Super HD DVR Video Security System employs an army of cameras to watch and protect. The ten camera fleet ensures that not a single corner goes without an eye on it. They record and replay in high definition reducing shadows and brightening the playback. In comparison, the Samsung Wisenet SmartCam Full HD Wi-Fi Camera is a single camera system. The memory is far less than the Samsung Wisenet Super, but some homeowners only require an SD card either because they have the time to self-monitor or they utilize a monitoring service. 3. How much memory is too much memory? The Samsung Wisenet Super HD DVR Video Security System has a 16 channel DVR with a 2TB hard drive. The access to a DVR permits hard drive space to store the comings and goings of those in a household. It also stores more data, meaning information needed down the road is still available. The Samsung Wisenet SmartCam Full HD Wi-Fi Camera has a microSD card slot for video storage up to 128GB. The differences in memory are enormous, but it has everything to do with what an individual requires versus what is underutilized and unnecessary. Both types of Samsung security camera systems have night vision. However, the difference in scope is quite significant. For instance, the Samsung Wisenet Super HD DVR Video Security System has the ability to see 130 feet at night. The true day and night camera is accurate in imaging using an IR Cut Filter. In vast contrast, the Samsung Wisenet SmartCam Full HD Wi-Fi Camera only has a 32-foot night gaze. The images captured are quality video, but the field is far smaller. The size of space has everything to do with what system is best for an individual. For an apartment, the SmartCam is likely enough. However, for larger homes or commercial property, the Wisenet Super is the best security option. 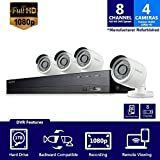 People who are go-getters with time on their hands may find assembling and installing the Samsung Wisenet Super HD DVR Video Security System worth the energy. However, the Samsung Wisenet SmartCam Full HD Wi-Fi Camera comes with a home kit that makes it naturally more straightforward to install. In either case, home security professionals such as Protect America is available. They offer free quotes and do not charge installation fees. Protect America also monitors homes 24 hours a day, seven days a week.